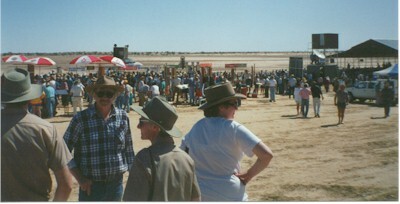 XXXX Triva Question (under cap): In which town are the Birdsville Races held? 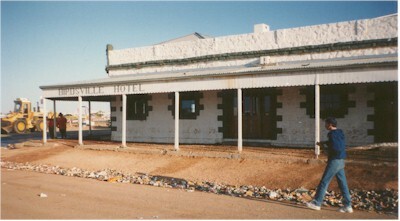 There is not an Australian alive that has not heard of Birdsville, and its famous races and pub. Indeed, as the above quote indicates, it has recently been immortalised as a trivia question in Queensland's favourite beer caps. It has the reputation for being, in a lot of ways, the heart of Queensland. Now while most Australians (and even Queenslanders) don't get to discover Birdsville for themselves, at AustralianBeers.com we have the privilege of being able to do a bit of fieldwork for the benefit of the beer drinkers of the nation (and indeed, the world). And we love it. However, before we put our drinking boots on we had to work out how to get there. You see, the problem is that Birdsville is out bloody woop-woop, as we say - some 1600 km west of Brisbane and in the middle of some of Australia's harshest and driest country. As we studied our maps we couldn't help but remember the poor Page family whose car broke down in 1963 only 100km along the Birdsville Track. Mum, Dad and the three kids bravely embarked on the journey in the blistering heat. No water. No shade. Hand in hand. Their bodies were found, one by one, along the road. Shockingly dehydrated. A monument, dear to the locals, has been erected on the track in their memory. With this in mind, we decided to charter a small plane and fly. This mode of transport, according to Dave our pot-bellied pilot, was quite common with the tourists who embark every year on the pilgrimage to the most famous of outback races: the Birdsville Races. Held every year in September, the races hold almost a religious significance to the 5000 dedicated piss-swillers and racegoers who overwhelm the 100 locals. In the old days, according to Dave as he showed us to our seats, the locals were quite bitter about the whole event as the tourists drank the place dry. Nowadays, they have truckloads of kegs sent in anticipation, and a riot is had by all. We just nodded quietly as Dave turned over the motor. The plane looked as though it belonged in an Indiana Jones movie. It fired and Dave looked over his shoulder - "There's an esky in the back", he grinned. "I'd have one meself but they're cracking down". Right. With one hand gripped tightly to our chair, and the other tightly to our icy-cold XXXXs, we entrusted our life into the pot-bellied one and headed off once again into the Queensland outback. A couple of beers later and everything seemed fine. Looking down, the land looked as it was: hash, hot, dry and barren. How the bloody hell the aborigines lived there is anyone's guess. They survived, so the story goes, by sucking out the few drops of fluid that form under the backs of small beetles that can still be found in rock formations. As it turns out, we were down to the last drops of fluid in bottles we found in the esky when Dave cried out, "Thank Christ", "We're here - and there's the pub! Thank f*ck for that". Obviously not keen on walking too far, he dipped the nose of the plane and brought it down roughly to what seemed meters from the pub. "You'll have to handle your own bags", he cried, "I need a bloody beer". And with that, he scurried inside the temple we had travelled so far to see: the Birdsville Pub. Note the beer cans littering the gutter. The front end loader visible on the left of the picture is used to clean up the cans after the races. We decided also that our bags could wait, and followed Dave in to see what was in store. After having visited the outback from Longreach to Kalgoorlie, we thought we knew what would we would find: a couple of dinkum aussie blokes sucking down a few cold ones who would say a cheery g'day before offering to shout us a few beers. Sounded bloody marvellous. Instead, we wandered into the bar, and were struck by a couple of blokes wearing towels over their head. Not to be distracted from the task at hand, we approached the bloke behind the bar and checked out what was on offer: fourex (of course), VB (of course) and Calton Midstrength (didn't surprise us). Having quickly revised our ordering guide prior to the trip, we lapsed into the local lingo, "jug a fourex thanks mate". He started pulling the jug as we checked out our fellow drinkers. They were sitting there quietly under their towels, speaking a strange language, and drinking what looked to be lemonade. Always interested in exploring different cultural experiences, we waltzed up to their table and said g'day. "Wadda drinking mate", one of us said, "our shout". The first bloke looked around nervously as though we were about to attack him. "I am very sorry", he said slowly with a strange accent, "but I do not speak Australian English very well". "No worries mate", we said, as we poured him and his mate a pot. "You'll be right". And indeed, some three or four pots later, he was right. Ubjab, was his name, Abdo, was his mate's. They had come all the way from Iraq to be part of the famous Birdsville camel races. 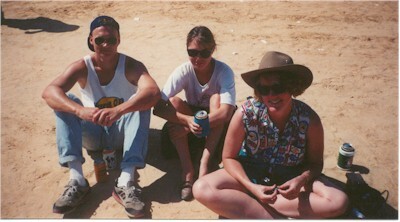 They bred 'em back home, and it had been their dream for better part of their life to check out good old Birdsville. And why the hell not. Perhaps because they had never drunk beer before, Ubjab and Abdo were soon very keen for us to check out the camels they had hired for the week. So, with a 6-pack under each arm we followed them out in search of their beasts of burden. Well, the camel story is best left told another day - suffice to say we can confirm their love of the amber nectar. 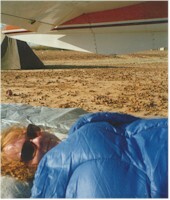 By now we were ready to hit the sack, and, given the town had swollen to 50 times its normal population, did as the others did and slept under the wings of Dave's plane in our swags. After a night under the stars, we were set to enjoy the main event: the Birdsville Races. Somewhat amazingly in these modern times, the Birdsville Races are a charity event for the Birdsville Hospital and the Royal Flying Doctors with 100% of the gate takings going to these good causes. But don't think the races aren't fair dinkum - the total prize money now reaches $100,000. Not bad for outback Queensland. But of course it is neither the charities nor the racing fraternity who are the big winners from the weekend. The real money is in alcohol sales with race goers spending about $200,000 on beer over the course of the weekend. That's a cool $40 per head for every man, woman and child spent on the good stuff. Having done our bit to make up for the statistical imbalance caused by the non-drinking children, we finally awoke Dave from behind the pub and, having made sure he was up to it, headed back to the big smoke. Unquestionably, the Birdsville races are an Australian icon. Plenty of cold beer, a flutter on the races and sleeping under the stars in the great Australian outback ensure that any excursion to the Birdsville Races becomes an unforgettable Australian experience. And don't forget, tell them AustralianBeers.com sent you.